After being in a knitting funk the past few weeks (mostly due to having to frog a project that was 50 percent completed), this week I’m determined to get my knitting groove back. Saturday night I went over to a friend’s house and we knitted and watched TV for a few hours, and that definitely helped. I finally frogged the hat and basically started over. 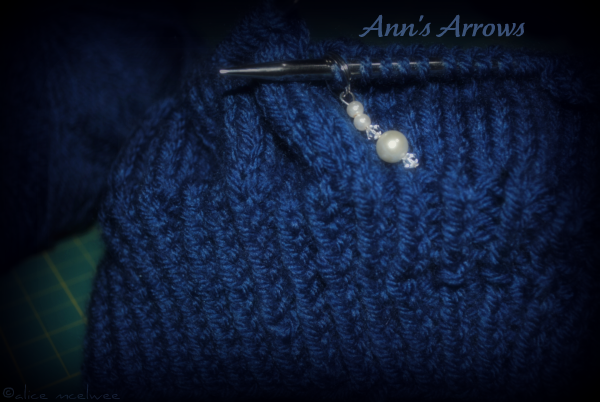 I tinked back until there were about 10 rows on the needles and restarted the pattern. I stopped knitting when I reached the point where I had previously frogged (mostly because it was late and I didn’t want to start the pattern and stop in the middle). BTW, I got a new Nikon D3000 over the weekend, and it’s flipping amazing. There’s a reason my last post was more than a week ago. I’ve been in a knitting funk. Two weeks ago I began a slouchy hat for one of my favorite authors. Halfway through, I realized that I forgot the increase round. You know, that round that’s going to make the slouchy hat slouchy? Yea. Totally did not see that line in the pattern. Of course, I noticed this 17 rows after I was supposed to knit that round. Because it was late, I decided I would tink back the next day and just reknit. Only, the next day came and I was still upset at having to frog half the project, so I left it alone for another day. Then another. Then another. Suddenly, it’s a week later, and I still have not touched that damn hat. I really hate frogging. I’m already a slow knitter to begin with, so even though it’s just 17 rows (which really, is not a lot and I did this in an evening while watching a movie on Netflix), all I can seem to focus on is that it’s two hours of wasted knitted. 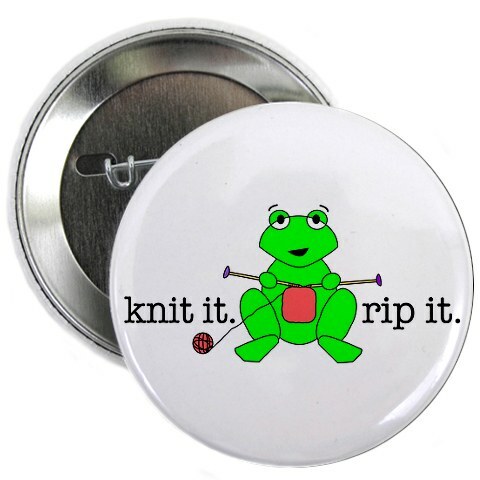 I can’t possibly be the only knitter who gets put into a funk when faced with frogging. The good news is that I’m on Spring Break, so I have lots of free time to reknit the hat. I’ve also started rewatching Doctor Who on Netflix, and knitting + Netflix = awesome times. How do you deal with frogging? Do you get put in a funk like I do and stop knitting for a day or two (or week) or do you just shrug it off and knit on? Normally, my book reviews are reserved for Book Addicts; however, since this book is not the type of book I normally review over there, I thought I’d review it here, since I believe it will resonate with knitters of all types. A memoir of crossing cultures, losing love and finding home by a New York Times Notable author. As steadily and quietly as her marriage falls apart, so Kyoko Moris understanding of knitting deepens. From flawed school mittens to beautiful unmatched patterns of cardigans, hats and shawls, Kyoko draws the connection between knitting and the new life she tried to establish in the U.S. Through the last, empty days of her marriage, Kyoko finds a way to begin again. Interspersed with the story of knitting throughout, the narrative contemplates the nature of love, loss and what holds a marriage together. Kyoki Mori delivers a moving account of her life by threading together various knitting projects with different episodes in her life. As Mori’s story unravels, you share pain when she loses her mother, the frustration she feels with her family, the slow demise of her marraige and the joy she finds when she takes charge of her life. I don’t read many memoirs, but I thoroughly enjoyed Mori’s story. Though at times the story is slow-paced, threads of Mori’s youth weave seamlessly with lessons she learns as adult. Each section in the book corresponds with a different project, and they range in their difficulty: scarves, cardigans, fair isle, etc. At one point she compares her marriage to instarsia — her and husband come together when it suits them, knitting together the image the pattern calls for, but when the image is done, they separate until the next pattern. The book jumps back and forth a lot from Mori’s youth to her present day, but Mori is so frank and honest about her life that the way she tells her story works beautifully. Though Mori is a drastically different type of woman than I am, she is comfortable in her own skin and in the end I admire her strength and courage. “Yarn — Remembering the Way Home” is more than just the memoir of a knitter. It’s a story woven together in pieces, and much like in a knitted garment, the end result is worth it. Like I mentioned in my last post, I didn’t get to finish many projects this month. I did a nice pair of cabled fingerless gloves for a friend’s daughter and I also knit a cozy for my Sony Daily Edition eReader (which, btw, I love). I’m pretty proud of my eReader cozy. I’m a huge Doctor Who fan — but if you follow me on Twitter or Tumblr, you probably already know this. While searching Ravelry for eReader cozy patterns, I came across an iPod cozy pattern in the shape of a TARDIS*. I just about died with geeky glee. 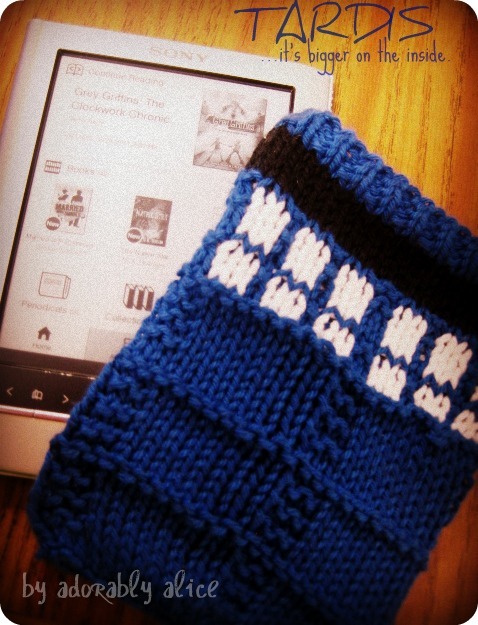 With a few easy adjustments to the pattern, I was able to knit a TARDIS for my eReader. 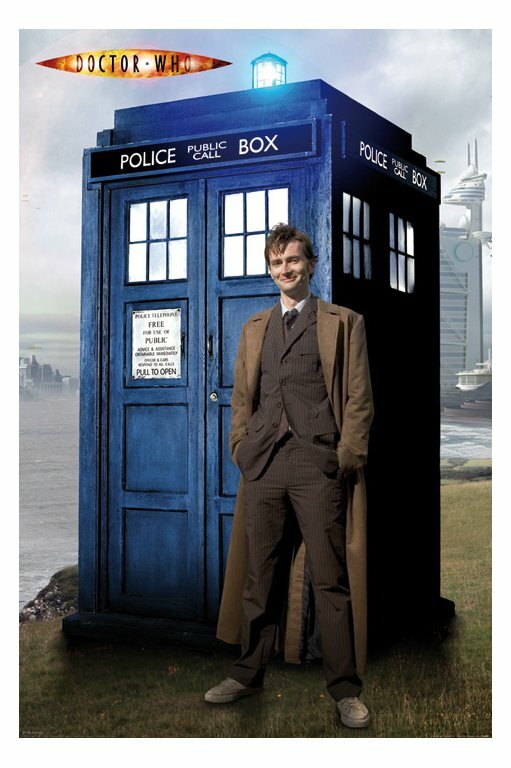 TARDIS: Stands for Time And Relative Dimension(s) In Space. It’s a blue police box the Doctor uses to travel through time and space. 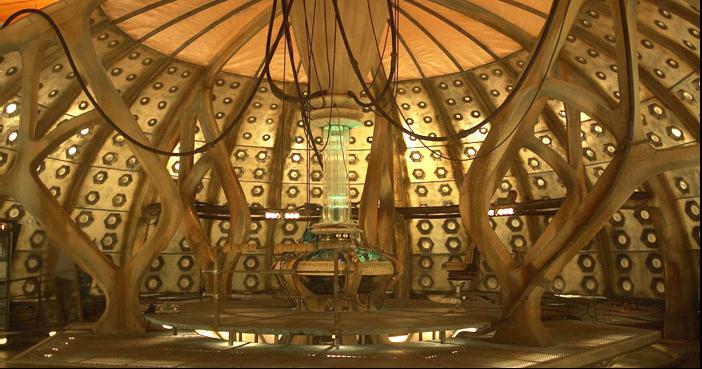 “It’s bigger on the inside.“: What the Doctor often says when someone new steps into the TARDIS. On the outside, it’s a normal blue police box. On the inside, it’s epic. 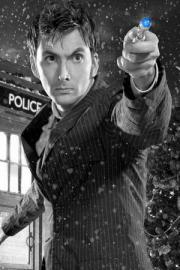 And one more picture of the Tenth Doctor, just because. The TARDIS, the Tenth Doctor and the almight Sonic Screwdriver! If you don’t watch Doctor Who…you really should. It’s lots of fun. Especially the seasons with David Tennant. He’s my favorite Doctor by far. If you have Netflix, the first four seasons are available via instant streaming. Been super busy lately, but still managed to finish a few projects this month. Unfortunately, I didn’t get to participate in the Tumblr KAL this month, but the pattern is in my queue (among many others) to be knitted at a later date (or, you know, to make my queue look pretty). 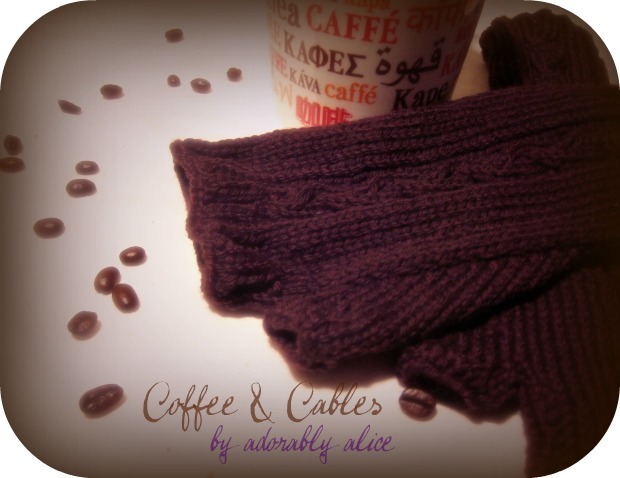 One of the projects I managed to finished this month was a pair of cabled fingerless gloves for a friend’s daughter. Her daughter works for Starbucks, so we bartered: some fingerless gloves for a pound of coffee (I really do miss those weekly markouts from Sbux). It was my first time doing fingerless gloves with a thumb gusset and despite a pattern that was a little confusing to read, they came out pretty damn good. I adapted the pattern just a wee bit; my friend told me her daughter had large hands. Now, my hands are tiny, so while I was knitting these, I’d try them on and think, “Oh no! These are way too big! !” So I was very happy when my friend told me that the size was perfect for her daughter. 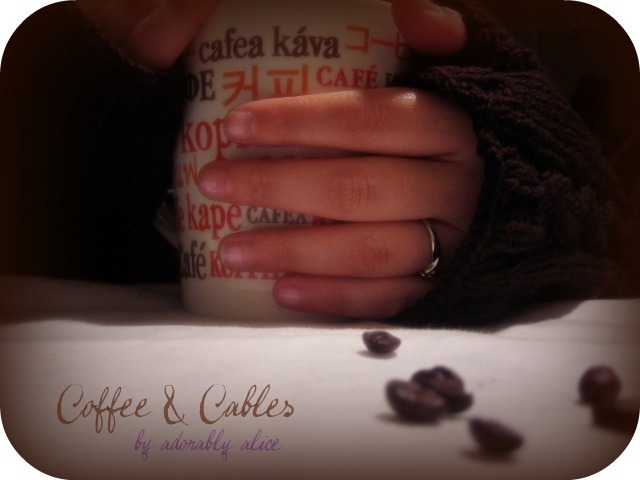 The pattern is really easy; it’s a good introduction to both cables and thumb gussets. However, I’d caution one to keep a notebook handy. Even though the pattern is easy, midway through the pattern stops including the cable pattern, which is something you want to keep in mind so that the cables go all the way up the glove. It helped me to keep track of rows on a pad of paper. Other than that, though, great pattern. Definitely going to have to make more of these in the future. A few days ago on Twitter, I said something to one of my favorite authors (Ann Aguirre, who also writes as Ava Gray and is one half of Ellen Connor) about being her minion. She was pretty excited about having minions, so she delegated her first task: for me to knit her a hat. Now, while she may have thought we were just joking, I got really excited. Honestly. You would have thought someone had given me tickets to the Quidditch World Cup. 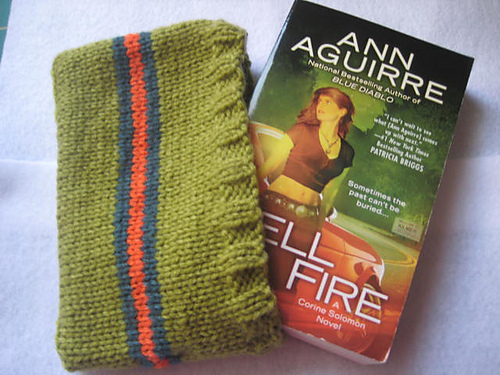 Ann Aguirre asked me to knit her a hat. For most others, I’d think the highlight of their life would be to meet a movie star or a musician. And while I acknowledge that it would be hella cool to brush shoulders with a movie star or a musician (remember, Michael Buble is my secret other husband), avid book addict that I am — authors are my movie stars. Not only do they create some awesome, memorable characters, they build complete worlds with languages, religions, governments, etc. A lot of movies are based on books. Without authors, Hollywood would be dead. So when Ann jokingly ordered me to knit her a hat, my response was: What color? What type? Beanie? Slouchy? To which she replied blue and slouchy. Meanwhile, I’m giggling like an idiot because one of my favoritest authors ever is asking me to knit for her. I promptly announced this to Twitter and Facebook. So Saturday, I bought some blue yarn. Three different balls of yarn in three different shades of blue. First though, I promised a friend I’d knit her daughter some fingerless gloves, so that’s what I have on my needles at the moment. After these gloves are done though, I’m totally switching to hats for Ann. Oh, I did finish my Tardis eReader cozy, but I can’t find my camera. Rawr. Hopefully I’ll find and charge it this week so that I can beaucoup pictures next Monday. What are some of your favorite slouchy hat patterns? You should read Ann Aguirre. 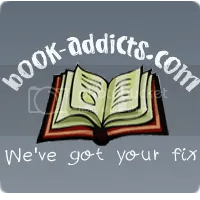 She writes urban fantasy (Corine Solomon series), scifi (Sirantha Jax series) and apocalyptic young adult (Razorland series) as Ann Aguirre, paranormal romance (Skin series) as Ava Gray and apocalyptic paranormal romance (Dark Age Dawning series) as Ellen Connor.